Buying a central vacuum for your home is a wise choice that comes with many benefits. In addition to being convenient and easy to use, a central vacuum system boasts a high level of performance and allows you to keep your house spick and span. It goes without saying that a powerful vacuum gets rid of dust. But did you know that is also helps eliminate allergens, reducing symptoms commonly associated with allergies or respiratory diseases along the way? 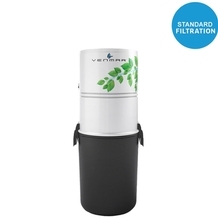 Our central vacuum systems, like all Venmar products, contribute to indoor air quality, whether you live in an apartment, a house or other. 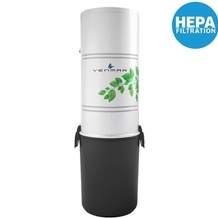 Venmar offers three sizes of central vacuum systems, each one designed to meet a different type of need. Each model comes with its own set of features. 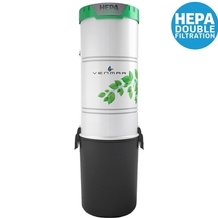 Our 650 and 600VF models are equipped with HEPA filters, a highly efficient component that filters even the smallest particles for maximum cleanliness. As for our compact model, its design is convenient and efficient, perfect for tight spaces. To give you peace of mind, all our central vacuum systems come with a 5 or 10-year warranty, depending on the model chosen. One way to ensure your central vacuum system’s efficiency is having it properly installed. At Venmar, we only work with trustworthy installers with a solid track record. If you’re unsure about which central vacuum system to choose, or if you need more information on our products, feel free to contact us; a member of our team will gladly take the time to advise you and help you make the right decision. Some of the questions we might ask could be about the size of your property, the type of floor covering, the number of people living under the same roof, and many other factors that influence the choice of a central vacuum system.